What is the GAUSS Function? The GAUSS function is categorized under Statistical functionsFunctionsList of the most important Excel functions for financial analysts. This cheat sheet covers 100s of functions that are critical to know as an Excel analyst. It will return the probability that a member of a standard normal population will be between the mean and a specified number of standard deviations from the mean. In other words, GAUSS gives us a way to solve a specific case where the range goes from the mean to a point above the mean. As a financial analystFinancial Analyst Job DescriptionSee a real Financial Analyst Job Description including all the skills, experience, and education required to be the successful candidate for the job. Perform financial forecasting, reporting, and operational metrics tracking, analyze financial data, create financial models, the GAUSS function is useful in understanding markets, prices, and probabilities. For example, if we wish to invest $5,000 in stocks and bonds with annual return rates of 15% and 6%, respectively, we can use the function to find out how to allocate the amount to get the desired return(s). 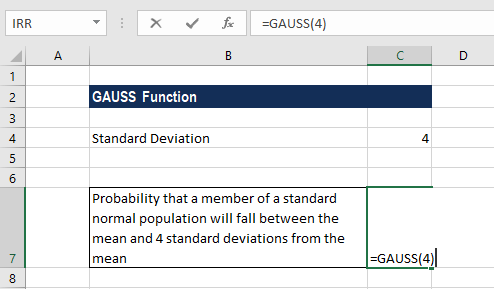 GAUSS was introduced in MS Excel 2013 and is not available in earlier versions. The function is capable of efficiently handling large datasets and providing tools for easy data management, making it suitable for conducting analysis using high frequency, real-time data. Z (required argument) – It is the real number at which we want to evaluate the GAUSS function. 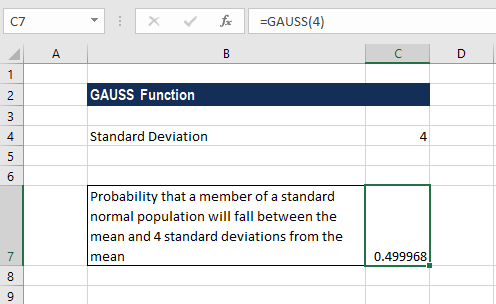 How to use the GAUSS Function in Excel? #VALUE! error – Occurs when any of the number arguments that are provided directly to the function are text strings that cannot be interpreted as numbers, that is, the value provided for Z is non-numeric. #NUM! error – Occurs when the given value of Z is an invalid number. As NORM.S.DIST(0,True) always returns 0.5, GAUSS(z) will always be 0.5 less than NORM.S.DIST(z,True). The GAUSS function is not particularly meaningful for negative values of z. To calculate the probability that something falls in the range of -1.5 to the mean, we need to use the formula =GAUSS(1.5). If we use Excel 2010 or earlier versions, the formula is =NORM.S.DIST(z,True)-0.5.